In four months, 155 countries will together switch from using trivalent to bivalent oral poliovirus vaccine. Will this change lead to more cases of poliomyelitis? There are three serotypes of poliovirus, each of which can cause paralytic poliomyelitis. 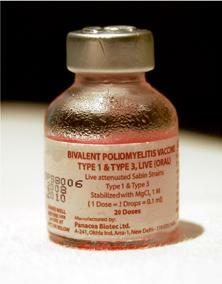 The Sabin oral poliovirus vaccine (OPV), which has been used globally by WHO in the eradication effort, is a trivalent vaccine that contains all three serotypes. In September 2015 WHO declared that wild poliovirus type 2 has been eradicated from the planet – no cases caused by this serotype had been detected since November 1999. However, in 2015, there were 9 cases of poliomyelitis caused by the type 2 vaccine. For these reasons WHO decided to remove the type 2 Sabin strain from OPV, and switch from trivalent to bivalent vaccine in April 2016. After OPV is ingested, the viruses replicate in the intestinal tract, providing immunity to subsequent infection. During replication in the intestine, the vaccine viruses lose the mutations that prevent them from causing paralysis. Everyone who receives OPV sheds these revertant viruses in the feces. In rare cases (about one in 1.5 million) the revertant viruses cause poliomyelitis in the vaccine recipient (these cases are called VAPP for vaccine-associated paralytic poliomyelitis). Vaccine-derived polioviruses can also circulate in the human population, and in under-vaccinated populations, they can cause poliomyelitis. There were 26 reported cases of poliomyelitis caused by the type 1 or type 2 vaccine viruses in 2015. Nine cases of type 2 vaccine-associated polio were detected in four countries: Pakistan, Guinea, Lao People’s Democratic Republic, and Myanmar. Removing the type 2 strain from OPV will eliminate vaccine-associated poliomyelitis in recipients caused by this serotype. When the US switched from OPV to the inactivated poliovaccine (IPV) in 2000, VAPP was eliminated. The problem with the trivalent to bivalent switch is that vaccine-derived type 2 poliovirus is likely still circulating somewhere on Earth. The last two reported cases of type 2 vaccine-associated polio in 2015 were reported in Myanmar in October. The viruses isolated from these cases were genetically related to strains that had been circulating in the same village in April of the that year. In other words, type 2 vaccine-derived strains have been circulating for an extended period of time in Myanmar; they have been known to persist for years elsewhere. If these viruses continue to circulate past the time that immunization against type 2 virus stops, they could pose a threat to the growing numbers of infants and children who have not been immunized against this serotype. Eventually as type 3, and then type 1 polioviruses are eradicated, it will also be necessary to stop immunizing with the respective Sabin vaccine strains. The switch from trivalent to bivalent vaccine in April 2016 is essentially an experiment to determine if it is possible to stop immunizing with OPV without placing newborns at risk from circulating vaccine-derived strains. Over 18 years ago Alan Dove and I argued that the presence of circulating vaccine-derived polioviruses made stopping immunization with OPV a bad idea. We suggested instead a switch from OPV to IPV until circulating vaccine-derived viruses disappeared. At the time, WHO disagreeed, but now they recommend that all countries deliver at least one dose of IPV as part of their immunization program. Instead of simply removing the Sabin type 2 strain from the immunization programs of 155 countries, it should be replaced with the inactivated type 2 vaccine. This change would maintain immunity to this virus in children born after April 2016. Such a synchronized replacement is currently not in the WHO’s polio eradication plans. I hope that their strategy is the right one. vaccine-derived polio viruses (cVDPV) are a continuing problem that needs to be solved. As you say, we will have to wait and see if the removal of type 2 vaccine strain from OPV will result in fewer cases of vaccine-derived polio virus 2. As I understand it, an integral part of the WHO’s Polio Eradication and Endgame Strategic Plan 2013–2018 is also the introduction of at least one dose of inactivated polio vaccine (IPV) into routine immunization schedules, to mitigate the potential risk of re-emergence of type 2 polio following the withdrawal of Sabin type 2 strains from oral polio vaccine (OPV). A problem that may occur initially, is lower coverage with IPV than with Sabin, as immunization programs for IPV are rolled-out. Also, IPV in conjunction with bivalent OPV (containing just PV 1 and 3) may not give enough immunity to prevent the circulation of vaccine-derived PV2 strains in the population. eradication of wild polio viruses. So there will be time to address a secondary strategy, should type 2 cVDPVs persist, during the post-eradication phase, but before polio immunization ceases entirely. Ongoing polio surveillance will be important. Falling immunization rates could also be a risk. As Tim Booth points out above, countries that rely on OPV and will now be making the switch from trivalent oral vaccine to the bivalent version would also be bringing at least one dose of IPV into their immunisation schedule. Since this IPV will have inactivated virus strains against all three poliovirus types, wouldn’t that help? Are you suggesting that a monovalent IPV specificially against the Type 2 strain be given?